A recent report by the Institute of Medicine of the National Academies of Sciences, Engineering, and Medicine reveals the majority of Americans will experience a minimum of one diagnostic error during their lifetime. These diagnostic errors include such things as delayed or inaccurate diagnoses, improperly prescribed medications, and even unnecessary or botched surgeries. The consequences of a medical error on a patients mental and physical health can be severe. Until now, diagnostic errors have not garnered much attention, according to Victor Dzau, president of the National Academy of Medicine. This newly released report serves as a wake-up call to improve how diagnoses are made. 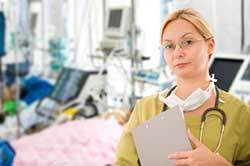 Diagnoses are often team efforts that extend from physicians, to medical technicians, to nursing staff. Errors in diagnosing are not new, but this report brings to light the importance of understanding and minimizing such errors. A culture that does not encourage honesty about diagnostic errors when they occur. An improper amount of feedback for physicians regarding how accurate diagnoses are. Lack of communication between patients, their families, and doctors. Reforming the medical liability system to foster honesty and to reveal diagnostic errors when they occur. Encouraging patients and family members to get involved in the diagnosis procedure. Physicians and health organizations providing patients with information regarding their diagnosis. Improving electronic health records to include test results and doctors notes. Fostering an environment conducive to patient feedback and/or questions about potential errors. Creating systems within healthcare organizations to help distinguish diagnostic errors. If you have suffered because of a diagnostic error, contact one of the skilled medical malpractice lawyers at Phillips Law Group today. Call or text 1-800-706-3000 or fill out our FREE Case Evaluation Form today and learn more about your options from a licensed personal injury lawyer.